As a registered tellows user you have numerous advantages in the tellows forum. However, registration is not required to participate in our forum. Comments can be submitted as a registered or unregistered user. Registration works via OpenID. tellows Premium for Android App: One Month Free Trial! When you register yourself at tellows for the first time, you will get a one month free trial for the premium version of our app! You only need to download the tellows App to your Android phone and log in with your account in the application. The premium version will then be activated automatically. With the premium version, you are not just able to identify unknown numbers, but you can also block unwanted calls. In addition, you can use your personal blacklist to block the numbers that have been reported negatively by our users. You can edit submitted comments in the member area or on the number detail page. Negatively rated numbers are immediately added to your personal blacklist. If you use tellows products, your blacklist automatically includes all your previously rated numbers. 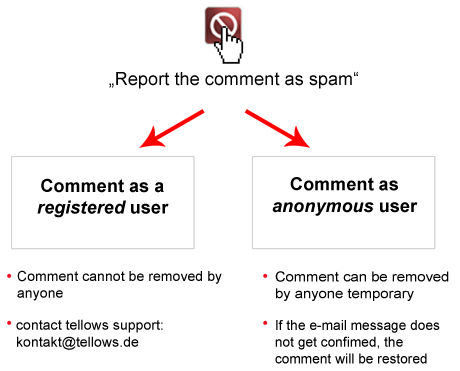 Comments from registered users cannot be removed without a thorough review by the tellows support. We’ll contact you if someone wants to remove your comment. As a registered user you do not need to enter captchas for each comment. The e-mail address of the user is automatically stored for notifications. When commenting, only the tick for the notification must be set. Comments from registered users are marked with a star symbol in the forum. The more your comments are considered helpful, the more „tellows karma“ you get. The more karma you’ve collected, the better. You can display your tellows karma in the member area. Simply click on „Login“ on the tellows page in the upper area and log in with one of the mentioned OpenID accounts. Only your email address will be stored in our system for comparison. You have to select a username after the connection. With this feature we contribute to significantly improving the quality and transparency of submitted comments. Learn more about: How does OpenID work? The member area is available to all registered users via desktop and mobile view. The tellows apps can also be linked to your user account. Negatively rated numbers immediately are added to your personal blacklist. It is important to login with your website or to link the app with your tellows account. Your personal blacklist contains all the numbers you have rated for yourself (regardless of the ratings of other users) and, of course, all other negatively rated phone numbers on tellows. Example: A phone number has a score of 6. You assign a score 8 when rating the number. The number then automatically ends up in your blacklist with the score 8. You can use the blacklist with all tellows products, such as the Fritz!Box, the mobile tellows apps, telephone systems (via CSV-API) or the tellows call blocker. This code is associated with your user account. If you are registered on tellows and buy a product using the same email address in the shop, your data will be linked to your user account. This means you will always receive personalized blacklists including your already rated numbers. All tellows products use the tellows API. With the purchase of a tellows API-Key or the tellows CSV-Lists you can make individual queries. For customization, various parameters are available to refine the output of the results. This will return results with phone numbers that correspond to e.g. the desired minimum score or that have a minimum number of comments. tellows API – Partnership Program. In the member area settings you can change your nickname and activate / deactivate the notifications. Registered users get news first! As a registered user you can edit your comments. Comments can be edited directly after submission. A wrong rating, typos or additional information can be corrected quickly without having to post the whole comment again. You can edit comments in the member area under „My Comments“ or on the number detail page itself. Actively Participate: Support Us as a Moderator and Improve tellows! Numerous members of the community already examine tellows for spam every day and contribute to the quality of the forum. They have an important task, because the quality of the content on our website is our top priority. With the moderator feature we want to improve the review and removal process of comments and help you become an even more important part of the tellows community. If you are interested in joining the moderator team, feel free to contact us via mail.